Alternately titled, The Unparalleled Adventure of One Hans Pfaall : "The moon, being the nearest to the earth of all the heavenly bodies, has always occupied the imagination of men. Many fanciful accounts have been written of voyages to the moon, of which the following story by Edgar Allan Poe is among the best. So wonderful has been the advance of science that it is conceivable that at some distant time in the future the inhabitants of this world may possibly be able to visit the beautiful body which lights the night for us." Published in the anthology, The Literary World Seventh Reader , preface by John Calvin Metcalf (1919). After a long and arduous devotion to the study of physics and astronomy, I, Hans Pfaal of Rotterdam, at length determined to construct a balloon of my own along original lines and to try a flight in it. Accordingly I had made an enormous bag out of cambric muslin, varnished with caoutchouc for protection against the weather. I procured all the instruments needed for a prolonged ascent and finally prepared for the inflation of the balloon. Herein lay my secret, my invention, the thing in which my balloon differed from all the balloons that had gone before. Out of a peculiar metallic substance and a very common acid I was able to manufacture a gas of a density about 37.4 less than that of hydrogen, and thus by far the lightest substance ever known. It would serve to carry the balloon to heights greater than had been attained before, for hydrogen is the gas usually used. The hour for my experiment in ballooning finally arrived. I had chosen the night as the best time for the ascension, because I should thereby avoid annoyances caused by the curiosity of the ignorant and the idle. It was the first of April. The night was dark; there was not a star to be seen; and a drizzling rain, falling at intervals, made me very uncomfortable. But my chief anxiety was concerning the balloon, which, in spite of the varnish with which it was defended, began to grow rather heavy with the moisture. I therefore set my assistants to working, and in about four hours and a half I found the balloon sufficiently inflated. I attached the car and put all my implements in it—a telescope, a barometer, a thermometer, an electrometer, a compass, a magnetic needle, a seconds watch, a bell, and other things. I had further procured a globe of glass, exhausted of air and carefully closed with a stopper, not forgetting a special apparatus for condensing air, a copious supply of water, and a large quantity of provisions, such as pemmican, in which much nutriment is contained in comparatively little bulk. I also secured a cat in the car. It was now nearly daybreak, and I thought it high time to take my departure. I immediately cut the single cord which held me to the earth, and was pleased to find that I shot upward with inconceivable rapidity, carrying with all ease one hundred and seventy-five pounds of leaden ballast and able to have carried as much more. Scarcely, however, had I attained the height of fifty yards, when roaring and rumbling up after me in the most tumultuous and terrible manner, came so dense a hurricane of fire and gravel and burning wood and blazing metal that my very heart sunk within me and I fell down in the car, trembling with terror. Some of my chemical materials had exploded immediately beneath me almost at the moment of my leaving earth. The balloon at first collapsed, then furiously expanded, then whirled round and round with sickening velocity, and finally, reeling and staggering like a drunken man, hurled me over the rim of the car; and in the moment of my fall I lost consciousness. I had no knowledge of what had saved me. When I partially recovered the sense of existence, I found the day breaking, the balloon at a prodigious height over a wilderness of ocean, and not a trace of land to be discovered far and wide within the limits of the vast horizon. My sensations, however, upon thus recovering, were by no means so replete with agony as might have been anticipated. Indeed, there was much of madness in the calm survey which I began to take of my situation. I drew up to my eyes each of my hands, one after the other, and wondered what occurrence could have given rise to the swelling of the veins and the horrible blackness of the finger nails. I afterward carefully examined my head, shaking it repeatedly and feeling it with minute attention, until I succeeded in satisfying myself that it was not, as I had more than half suspected, larger than the balloon. It now occurred to me that I suffered great uneasiness in the joint of my left ankle, and a dim consciousness of my situation began to glimmer through my mind. I began to understand that my foot had caught in a rope and that I was hanging downward outside the car. But strange to say! I was neither astonished nor horror-stricken. If I felt any emotion at all, it was a sort of chuckling satisfaction at the cleverness I was about to display in getting myself out of this dilemma. With great caution and deliberation, I put my hands behind my back and unfastened the large iron buckle which belonged to the waistband of my pantaloons. This buckle had three teeth, which, being somewhat rusty, turned with great difficulty on their axis. I brought them, however, after some trouble, at right angles to the body of the buckle and was glad to find them remain firm in that position. Holding with my teeth the instrument thus obtained, I proceeded to untie the knot of my cravat; it was at length accomplished. To one end of the cravat I then made fast the buckle, and the other end I tied, for greater security, tightly around my wrist. Drawing now my body upward, with a prodigious exertion of muscular force, I succeeded, at the very first trial, in throwing the buckle over the car, and entangling it, as I had anticipated, in the circular rim of the wicker-work. My body was now inclined toward the side of the car at an angle of about forty-five degrees; but it must not be understood that I was therefore only forty-five degrees below the vperpendicular. So far from it, I still lay nearly level with the plane of the horizon, for the change of position which I had acquired had forced the bottom of the car considerably outward from my position, which was accordingly one of the most extreme peril. It should be remembered, however, that when I fell from the car, if I had fallen with my face turned toward the balloon, instead of turned outwardly from it as it actually was—or if, in the second place, the cord by which I was suspended had chanced to hang over the upper edge instead of through a crevice near the bottom of the car—in either of these cases, I should have been unable to accomplish even as much as I had now accomplished. I had therefore every reason to be grateful, although, in point of fact, I was still too stupid to be anything at all, and hung for perhaps a quarter of an hour in that extraordinary manner, without making the slightest farther exertion, and in a singularly tranquil state of idiotic enjoyment. This feeling, however, did not fail to die rapidly away, and thereunto succeeded horror and dismay, and a sense of utter helplessness and ruin. In fact, the blood so long accumulating in the vessels of my head and throat, and which had hitherto buoyed up my spirits with delirium, had now begun to retire within its proper channels, and the distinctness which was thus added to my perception of the danger merely served to deprive me of the self-possession and courage to encounter it. But this weakness was, luckily for me, of no very great duration. In good time came to my rescue the spirit of despair, and with frantic cries and struggles, I jerked my body upward, till, at length, clutching with a vice-like grip the long-desired rim, I writhed my person over it and fell headlong and shuddering within the car. When I had recovered from the weakness caused by being so long in that position and the horror from which I had suffered, I found that all my implements were in place and that neither ballast nor provisions had been lost. It is now high time that I should explain the object of my voyage. I had been harassed for long by poverty and creditors. In this state of mind, wishing to live and yet wearied with life, my deep studies in astronomy opened a resource to my imagination. I determined to depart, yet live—to leave the world, yet continue to exist—in short, to be plain, I resolved, let come what would, to force a passage, if possible, to the moon. This was not so mad as it seems. The moon’s actual distance from the earth was the first thing to be attended to. The mean or average interval between the centers of the two planets is only about 237,000 miles. But at certain times the moon and earth are much nearer than at others, and if I could contrive to meet the moon at the moment when it was nearest earth, the above-mentioned distance would be materially lessened. But even taking the average distance and deducting the vradius of the earth and the moon, the actual interval to be traversed under average circumstances would be 231,920 miles. Now this, I reflected, was no very extraordinary distance. Traveling on the land has been repeatedly accomplished at the rate of sixty miles an hour; and indeed a much greater speed may be anticipated. But even at this velocity it would take me no more than 161 days to reach the surface of the moon. There were, however, many particulars inducing me to believe that my average rate of traveling might possibly very much exceed that of sixty miles an hour. The next point to be regarded was one of far greater importance. We know that at 18,000 feet above the surface of the earth we have passed one-half the material, or, at all events, one-half the ponderable body of air upon the globe. It is also calculated that at a height of eighty miles the rarefaction of air is so great that animal life can be sustained in no manner. But I did not fail to perceive that these calculations are founded on our experimental knowledge of the air in the immediate vicinity of the earth, and that it is taken for granted that animal life is incapable of modification. I thought that no matter how high we may ascend we cannot arrive at a limit beyond which no atmosphere is to be found. It must exist, I argued, although it may exist in a state of infinite rarefaction. Having adopted this view of the subject, I had little farther hesitation. Granting that on my passage I should meet with atmosphere essentially the same as at the surface of the earth, I thought that, by means of my very ingenious apparatus for that purpose, I should readily be able to condense it in sufficient quantity for breathing. This would remove the chief obstacle in a journey to the moon. I now turned to view the prospect beneath me. At twenty minutes past six o’clock, the barometer showed an elevation of 26,000 feet, or five miles to a fraction. The outlook seemed unbounded. I beheld as much as a sixteen-hundredth part of the whole surface of the globe. The sea appeared as unruffled as a mirror, although, by means of the telescope, I could perceive it to be in a state of violent agitation. I now began to experience, at intervals, severe pain in the head, especially about the ears, due to the rarefaction of the air. The cat seemed to suffer no inconvenience whatever. I was rising rapidly, and by seven o’clock the barometer indicated an altitude of no less than nine miles and a half. I began to find great difficulty in drawing my breath. My head, too, was excessively painful; and, having felt for some time a moisture about my cheeks, I at length discovered it to be blood, which was oozing quite fast from the drums of my ears. These symptoms were more than I had expected and occasioned me some alarm. At this juncture, very imprudently and without consideration, I threw out from the car three five-pound pieces of ballast. The increased rate of ascent thus obtained carried me too rapidly into a highly rarefied layer of atmosphere, and the result nearly proved fatal to my expedition and myself. I was suddenly seized with a spasm, which lasted for more than five minutes, and even when this in a measure ceased, I could catch my breath only at long intervals, and in a gasping manner—bleeding all the while copiously at the nose and ears and even slightly at the eyes. The cat mewed piteously, and, with her tongue hanging out of her mouth, staggered to and fro in the car as if under the influence of poison. I now too late discovered the great rashness of which I had been guilty in discharging my ballast, and my agitation was excessive. I expected nothing less than death, and death in a few minutes. I lay down in the bottom of the car and endeavored to collect my faculties. In this I so far succeeded as to determine upon the experiment of losing blood. Having no lancet, I was obliged to open a vein in my arm with the blade of a penknife. The blood had hardly commenced flowing when I experienced a sensible relief, and by the time I had lost about half a basin-full most of the worst symptoms were gone. The difficulty of breathing, however, was diminished in a very slight degree, and I found that it would be soon positively necessary to make use of my condenser. By eight o’clock I had actually attained an elevation of seventeen miles above the surface of the earth. Thus it seemed to me evident that my rate of ascent was not only on the increase, but that the progress would have been apparent to a slight extent even had I not discharged the ballast which I did. The pains in my head and ears returned at intervals and with violence, and I still continued to bleed occasionally at the nose; but upon the whole I suffered much less than might have been expected. I now unpacked the condensing apparatus and got it ready for immediate use. The view of the earth at this period of my ascension was beautiful indeed. To the westward, the northward, and the southward, as far as I could see, lay a boundless sheet of apparently unruffled ocean, which every moment gained a deeper and deeper tint of blue. At a vast distance to the eastward, although perfectly discernible, extended the islands of Great Britain, the entire Atlantic coasts of France and Spain, with a small portion of the northern part of the continent of Africa. Of individual edifices not a trace could be found, and the proudest cities of mankind had utterly faded away from the surface of the earth. At a quarter-past eight, being able no longer to draw breath without the most intolerable pain, I proceeded forthwith to adjust around the car the apparatus belonging to the condenser. I had prepared a very strong, perfectly air-tight gum-elastic bag. In this bag, which was of sufficient size, the entire car was in a manner placed. That is to say, the bag was drawn over the whole bottom of the car, up its sides and so on, up to the upper rim where the net-work is attached. Having pulled up the bag and made a complete inclosure on all sides, I was shut in an air-tight chamber. In the sides of this covering had been inserted three circular panes of thick but clear glass, through which I could see without difficulty around me in every horizontal direction. In that portion of the cloth forming the bottom was a fourth window corresponding with a small aperture in the floor of the car itself. This enabled me to see straight down, but I had been unable to fix a similar window above me and so I could expect to see no objects directly overhead. The condensing apparatus was connected with the outer air by a tube to admit air at one end and by a valve at the bottom of the car to eject foul air. By the time I had completed these arrangements and filled the chamber with condensed air by means of the apparatus, it wanted only ten minutes of nine o’clock. During the whole period of my being thus employed, I endured the most terrible distress from difficulty of respiration, and bitterly did I repent the foolhardiness of which I had been guilty in putting off to the last moment a matter of so much importance. But having at length accomplished it, I soon began to reap the benefit of my invention. Once again I breathed with perfect freedom and ease—and indeed why should I not? I was also agreeably surprised to find myself, in a great measure, relieved from the violent pains which had hitherto tormented me. A slight headache, accompanied by a sensation of fulness about the wrists, the ankles, and the throat, was nearly all of which I had now to complain. At twenty minutes before nine o’clock, the mercury attained its limit, or ran down, in the barometer. The instrument then indicated an altitude of twenty-five miles, and I consequently surveyed at that time an extent of the earth’s area amounting to no less than one three-hundred-and-twentieth part of the entire surface. At half-past nine, I tried the experiment of throwing out a handful of feathers through the valve. They did not float as I had expected, but dropped down like a bullet and with the greatest velocity, being out of sight in a very few seconds. It occurred to me that the atmosphere was now far too rare to sustain even feathers; that they actually fell, as they appeared to do, with great speed, and that I had been surprised by the united velocities of their descent and my own rise. At six o’clock P. M., I perceived a great portion of the earth’s visible area to the eastward involved in thick shadow, which continued to advance with great rapidity, until at five minutes before seven the whole surface in sight was enveloped in the darkness of night. It was not, however, until long after this time that the rays of the setting sun ceased to illumine the balloon, and this fact, although, of course, expected, did not fail to give me great pleasure. In the morning I should behold the rising vluminary many hours before the citizens of Rotterdam, in spite of their situation so much farther to the eastward, and thus, day after day, in proportion to the height ascended, I should enjoy the light of the sun for a longer and longer period. I now resolved to keep a journal of my passage, reckoning the days by twenty-four hours instead of by day and night. At ten o’clock, feeling sleepy, I determined to lie down for the rest of the night; but here a difficulty presented itself, which, obvious as it may appear, had escaped my attention up to the very moment of which I am now speaking. If I went to sleep, as I proposed, how could the air in the chamber be renewed in the meanwhile? To breath it more than an hour at the farthest would be impossible; or, even if this term could be extended to an hour and a quarter, the most ruinous consequences might ensue. This dilemma gave me no little anxiety; and it will hardly be believed that, after the dangers I had undergone, I should look upon this business in so serious a light as to give up all hope of accomplishing my ultimate design, and finally make up my mind to the necessity of a descent. But this hesitation was only momentary. I reflected that man is the slave of custom and that many things are deemed essential which are only the results of habit. It was certain that I could not do without sleep; but I might easily bring myself to feel no inconvenience from being awakened at intervals of an hour during the whole period of my repose. It would require but five minutes to renew the air, and the only difficulty was to contrive a method of arousing myself at the proper moment for so doing. This question caused me no little trouble to solve. I at length hit upon the following plan. My supply of water had been put on board in kegs of five gallons each and ranged securely around the interior of the car. I unfastened one of these and, taking two ropes, tied them tightly across the rim of the wicker-work from one side to the other, placing them about a foot apart and parallel, so as to form a kind of shelf, upon which I placed the keg and steadied it. About eight inches below these ropes I fastened another shelf made of thin plank, on which shelf, and beneath one of the rims of the keg, a small pitcher was placed. I bored a hole in the end of the keg over the pitcher and fitted in a plug of soft wood, which I pushed in or pulled out, until, after a few experiments, it arrived at that exact degree of tightness at which the water, oozing from the hole and falling into the pitcher below, would fill the latter to the brim in the period of sixty minutes. Having arranged all this, the rest of the plan was simple. My bed was so contrived upon the floor of the car as to bring my head, in lying down, immediately below the mouth of the pitcher. It was evident that, at the expiration of an hour, the pitcher, getting full, would be forced to run over and to run over at the mouth, which was somewhat lower than the rim. It was also evident that the water, falling from a height, could not do otherwise than fall on my face and awaken me even from the soundest slumber in the world. It was fully eleven by the time I had completed these arrangements, and I at once betook myself to bed with full confidence in my invention. Nor in this matter was I disappointed. Punctually every sixty minutes I was aroused by my trusty clock, when, having emptied the pitcher into the bung-hole of the keg and filled the chamber with condensed air, I retired again to bed. These regular interruptions to my slumber caused me less discomfort than I had anticipated; and when I finally arose for the day, it was seven o’clock and the sun was high above the horizon. I found the balloon at an immense height indeed, and the earth’s roundness had now become strikingly manifest. Below me in the ocean lay a cluster of black specks, which undoubtedly were islands. Overhead, the sky was of a jetty black, and the stars were brilliantly visible; indeed they had been so constantly since the first day of ascent. Far away to the northward I saw a thin, white and exceedingly brilliant line, or streak, on the edge of the horizon, and I had no hesitation in supposing it to be the southern disc of the ices of the Polar sea. My curiosity was greatly excited, for I had hopes of passing on much farther to the north, and might possibly, at some period, find myself directly above the Pole itself. I now lamented that my great elevation would, in this case, prevent me from taking as accurate a survey as I could wish. My condensing apparatus continued in good order, and the balloon still ascended without any perceptible change. The cold was intense, and obliged me to wrap up closely in an overcoat. When darkness came over the earth, I went to bed, although it was for many hours afterward broad daylight all around me. The water-clock was punctual in its duty, and I slept until next morning soundly, with the exception of the periodical interruptions. April 4th. I arose in good health and spirits, and was astonished at the singular change which had taken place in the appearance of the sea. It had lost, in a great measure, the deep tint of blue it had hitherto worn, being now of a grayish-white and of a luster dazzling to the eye. The curve of the ocean had become so evident that the entire mass of water seemed to be tumbling headlong over the abyss of the horizon, and I found myself listening on tiptoe for the echoes of the mighty cataract. The islands were no longer visible; whether they had passed down the horizon to the southeast, or whether my increasing elevation had left them out of sight, it is impossible to say. I was inclined, however, to the latter opinion. The rim of ice to the northward was growing more and more apparent. The cold was by no means so intense. April 5th. I beheld the singular sight of the sun rising while nearly the whole visible surface of the earth continued to be involved in darkness. In time, however, the light spread itself over all, and I again saw the line of ice to the northward. It was now very distinct and appeared of a much darker hue than the waters of the ocean. I was evidently approaching it, and with great rapidity. I fancied I could again distinguish a strip of land to the eastward, and one also to the westward, but could not be certain. April 6th. I was surprised at finding the rim of ice at a very moderate distance, and an immense field of the same material stretching away off to the horizon in the north. It was evident that if the balloon held its present course, it would soon arrive above the Frozen Ocean, and I had now little doubt of ultimately seeing the Pole. During the whole of the day I continued to near the ice. Toward night the limits of my horizon very suddenly and materially increased, owing undoubtedly to the earth’s form, which is round but flattened near the poles. When darkness at length overtook me, I went to bed in great anxiety, fearing to pass over the object of so much curiosity when I should have no opportunity of observing it. April 7th. I arose early, and, to my great joy, at length beheld what there could be no hesitation in supposing the northern Pole itself. It was there, beyond a doubt, and immediately beneath my feet; but alas! I had now ascended to so vast a distance that nothing could with accuracy be made out. Indeed, I estimated that at four o’clock in the morning of April the seventh the balloon had reached a height of not less than 7,254 miles above the surface of the sea. At all events I undoubtedly beheld the whole of the earth’s diameter; the entire northern hemisphere lay beneath me like a chart, and the great circle of the equator itself formed the boundary line of my horizon. April 8th. I found a sensible diminution in the earth’s size, besides a material alteration in its general color and appearance. The whole area partook in different degrees of a tint of pale yellow, and in some portions had acquired a brilliancy even painful to the eye. My view was somewhat impeded by clouds near the earth, but nevertheless I could easily perceive that the balloon now hovered above the great lakes in North America and was holding a course due south which would soon bring me to the tropics. This circumstance did not fail to give me the most heartfelt satisfaction, and I hailed it as a happy omen of ultimate success. Indeed, the direction I had hitherto taken had filled me with uneasiness, for it was evident that had I continued it much longer, there would have been no possibility of my arriving at the moon at all, which revolves around the earth in the plane of the equator. April 9th. To-day the earth’s diameter was greatly diminished, and the color of the surface assumed hourly a deeper tint of yellow. The balloon kept steadily on her course to the southward, and arrived at nine P. M. over the Mexican Gulf. April 12th. A singular alteration took place in regard to the direction of the balloon, and, although fully anticipated, afforded me the very greatest delight. Having reached, in its former course, about the twentieth parallel of southern latitude, it turned off suddenly at an acute angle to the eastward, and thus proceeded throughout the day, keeping nearly, if not altogether, in the exact plane of the moon’s path around the earth. April 13th. Great decrease in the earth’s apparent size. The moon could not be seen at all, being nearly above me. I still continued in the plane of the moon’s path, but made little progress eastward. April 14th. Extremely rapid decrease in the size of the earth. To-day I became strongly impressed with the idea that the balloon was holding the direct course which would bring it immediately to the moon where it comes nearest the earth. The moon was directly overhead, and consequently hidden from my view. Great and long continued labor was necessary for the condensation of the atmosphere. April 16th. To-day, looking upward as well as I could, through each of the side windows alternately, I beheld, to my great delight, a very small portion of the moon’s disk protruding, as it were, on all sides beyond the huge bulk of the balloon. My agitation was extreme, for I had now little doubt of soon reaching the end of my perilous voyage. Indeed, the labor required by the condenser had increased to such a degree that I had scarcely any respite from exertion. Sleep was a matter nearly out of question. I became quite ill, and my frame trembled with exhaustion. It was impossible that human nature could endure this state of intense suffering much longer. April 17th. This morning proved an epoch in my voyage. It will be remembered that on the thirteenth the earth had diminished; on the fourteenth, it had still further dwindled; on the fifteenth, a still more rapid decrease was observable; and on retiring for the night of the sixteenth, the earth had shrunk to small size. What, therefore, must have been my amazement, on awakening from a brief and disturbed slumber on the morning of this day, the seventeenth, at finding the surface beneath me so suddenly and wonderfully increased in volume as to seem but a comparatively short distance beneath me! I was thunderstruck! No words can give any adequate idea of the extreme, the absolute horror and astonishment, with which I was seized, possessed and altogether overwhelmed. My knees tottered beneath me—my teeth chattered—my hair started up on end. The balloon then had actually burst! These were the first ideas which hurried through my mind. The balloon had burst! I was falling—falling with the most impetuous, the most wonderful velocity! To judge from the immense distance already so quickly passed over, it could not be more than ten minutes at the farthest before I should meet the surface of the earth and be hurled into annihilation! But at length reflection came to my relief. I paused, I considered, and I began to doubt. The matter was impossible. I could not, in any reason, have so rapidly come down. Besides, although I was evidently approaching the surface below me, it was with a speed by no means commensurate with the velocity I had at first conceived. This consideration served to calm my mind, and I finally succeeded in looking at the matter in its proper point of view. In fact, amazement must have fairly deprived me of my senses when I could not see the vast difference in appearance between the surface below me and the surface of my mother earth. The latter was indeed over my head and completely hidden by the balloon, while the moon—the moon itself in all its glory—lay beneath me and at my feet! I had indeed arrived at the point where the attraction of the moon had proved stronger than the attraction of the earth, and so the moon now appeared to be below me and I was descending upon it. It lay beneath me like a chart, and I studied it with the deepest attention. The entire absence of ocean or sea, and indeed of any lake or river, or body of water whatsoever, struck me at the first glance as the most extraordinary feature in its appearance. April 18th. To-day I found an enormous increase in the moon’s apparent bulk—and the evidently increased velocity of my descent began to fill me with alarm. I had relied on finding some atmosphere at the moon and on the resistance of this atmosphere to gravitation as affording me a chance to land in safety. Should I prove to have been mistaken about the atmosphere, I had nothing better to expect than to be dashed into atoms against the rugged surface of the earth’s vsatellite. And indeed I had now every reason to be terrified. My distance from the moon was comparatively trivial, while the labor required by the condenser was diminished not at all, and I could discover no indication whatever of a decreasing rarity of the air. April 19th. This morning, to my great joy, about nine o’clock, the surface of the moon being frightfully near and my fears excited to the utmost, the pump of my condenser at length gave evident tokens of an alteration in the atmosphere. By ten, I had reason to believe its density considerably increased. By eleven, very little labor was necessary at the apparatus; and at twelve o’clock, with some hesitation, I ventured to open the car a little and suffered no inconvenience. I finally threw aside the gum-elastic chamber and unrigged it from around the car. As might have been expected, spasms and violent headache were the immediate consequences of an experiment so rash. But this was forgotten in consideration of other things. My approach was still rapid in the extreme; and it soon became certain that although I had probably not been deceived in the expectation of finding a fairly dense atmosphere, still I had been wrong in supposing that atmosphere dense enough to support the great weight contained in the car of the balloon. I was now close upon the planet and coming down with the most terrible rapidity. I lost not a moment, accordingly, in throwing overboard first my ballast, then my water-kegs, then my condensing apparatus and gum-elastic chamber, and finally every article within the car. But it was all to no purpose. I still fell with horrible speed, and was now not more than half a mile from the surface. As a last resource, therefore, having got rid of my coat, hat, and boots, I cut loose from the balloon the car itself, which was of no inconsiderable weight, and thus clinging with both hands to the net-work, I had barely time to observe that the whole country, as far as the eye could reach, was thickly sown with small habitations, ere I tumbled headlong into the very heart of a fantastic city and into the middle of a vast crowd of ugly little people. I turned from them, and gazing upward at the earth so lately left, and left perhaps forever, beheld it like a huge, dull copper shield, fixed immovably in the heavens overhead and tipped on one of its edges with a crescent border of the most brilliant gold. 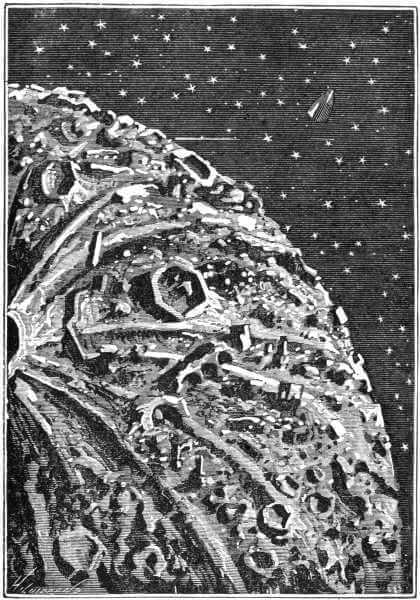 You might also enjoy reading Jules Verne's novel, All Around the Moon. Add A Voyage to the Moon to your own personal library.